The new exhibition, “Wine, Water, and Oil: Domestic Vessels from the Greek and Roman World,” presents a picture of daily domestic life in the ancient world through objects familiar to Greek and Roman households. 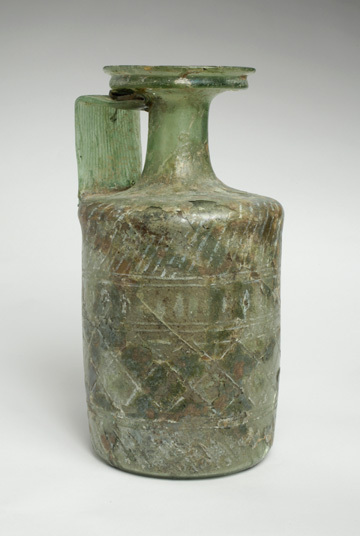 These artifacts reconstruct the quotidian practices in antiquity by focusing on three liquids that were instrumental to daily life: wine, water, and oil. Rituals developed around the consumption of wine in the early archaic period and the use of elegant and expensive wine-pouring vessels and drinking cups elevated the experience to a distinct and even transcendental event. The practice including combining water and wine to a preferred concentration and then pouring the mix from a spouted oinochoe into a gracious stemmed cup (the kylix). Water kept the household running and was held in storage vessels of various sizes ranging from the amphora (usually brought to the fountains to fill) to pitchers, jugs and cups. Oils were closely associated with the female world: small size containers (unguentaria) held perfumed oils that were used to hold perfumes and scented oils. The small, elegant containers were fitting packaging for the precious contents. Lastly, oil was also used in the house for lamps that would have lit dining spaces, kitchens and workspaces, as well as bedrooms. While the original contents are long gone, the Greek and Roman vessels on display illustrate how these three liquids were an essential part of daily life in the ancient Mediterranean. This exhibition opened September 1, 2016.